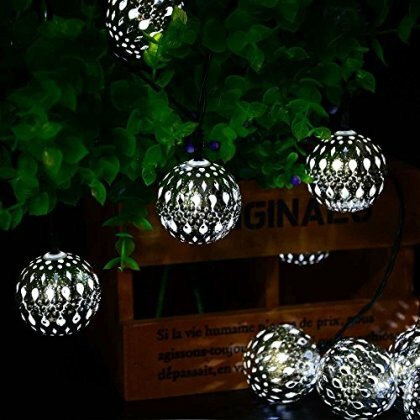 FESTIVE DECORATION - Hang these solar string lights around the garden or trees to decorate your outdoor space or replace your traditional plug-in string lights with these solar-powered beauties. SOLAR POWERED - These LED lights decorate your garden with solar energy and no extra power is required. PRODUCT DIMENSIONS - 6.5-feet lead circuit and 11-feet wire with 10 Moroccan ball lights. Steady and blinking double working modes make your environment out of ordinary. It is an ideal for decorating your passage, garden, patio, party, etc. LONG-WORKING TIME - 600mAh rechargeable battery can work continuously for 8 hours once fully charged. Just replace the RECHARGEABLE BATTERY WITH NORMAL BATTERY when there is not enough sunshine, then it will work. EASY TO USE - The solar panel is easily installed. These lights are turned on automatically in darkness and turned off automatically in brightness. Power and mode double buttons are on the back of panel box for controlling. The mode switch allows you to adjust between steady or flashing strobe effects.